Ceramic Tile | Collins Flooring America - Belleville, ILWe have a new 800 number, but you can still call us at 618-234-2915 if you prefer. Do you want an impressive way to improve the value of your home and enhance the appeal of your rooms? Install ceramic tile on your floors! Easy to maintain and perfect for any room, ceramic tile flooring is an excellent flooring option for those who want to be practical as well as stylish. We have a wide selection of products at our showroom. That means you are certain to locate what you want. Simply ask one of our flooring specialists to assist you in locating the right ceramic tile in Swansea, IL, for your home or business. Moisture Resistance: Tile’s non-porous composition keeps water from absorbing into the flooring. As a result, this flooring option resists the growth of mold and mildew. Ceramic bathroom tile is a common and dependable choice. Easy Maintenance: Ceramic is made from dense material, making it a strong flooring type that won’t require periodic refinishing. On top of that, dust and dirt are easy to clean up. Simply use a mop and approved cleaning solution to keep your investment looking new. Scratch Resistance: Since ceramic tile is heavy, it resists scratches and scuffs with ease. Everyday wear and tear is no problem when you invest in tile. Stain Resistance: Spend less time cleaning and more time enjoying the scenery. Ceramic flooring won’t absorb liquids, so dust and liquids can be wiped away with ease. Color Permanence: Ceramic is finished with a wide variety of glazes and finishes. This allows you to mix and match your favorite colors to make brilliant designs. The colors are meant to stay. Hygienic: Since ceramic is easy to clean and resists mold and mildew, it is a safe investment for households with pets and children. If you want something different from hardwood yet something harder than carpet, why not choose ceramic tile? This flooring product adds dramatic beauty to any room. Best of all, because it comes in so many varieties, you’re sure to find a color and style that matches your design preferences. In addition, ceramic tile lasts a lifetime or longer. Why limit yourself when you want a new floor? With so many varieties and different brands at our showroom, your options are virtually limitless. We display the latest designs and products from leading manufacturers. Highly revered for beauty and durability, our extensive selection of ceramic tile allows great flexibility for your next remodeling project. Not sure where to start? Don’t worry, we’re here to help. Our sales representatives stay up-to-date with the latest trends in ceramic flooring. Simply tell us your design goals, and we will direct you to products that match your sensibilities. So whether you are looking for an Old Word aesthetic or something chic and contemporary, we can point you in the right direction. Or, mix and match and establish your own, new look. Tile’s customizability allows for a wealth of options. Thanks to advances in manufacturing and design, ceramic tile is now even more versatile than before. Tile can be finished with designs and patterns that look similar to other materials. We are all familiar with the look and practicality of bathroom ceramic tile. Transform your space into a rustic scene with ceramic woodgrain tile. Designs that closely resemble the natural grain and color of popular wood species are available at our showroom. From selection to installation, we help you every step of the way. Our installers have many years of experience installing backsplashes, floors and showers with skill and care. In addition, we extend special guarantees for select products and services. After selecting your new floors, our experienced technicians will install the new floor for you. Best of all, if you are not satisfied with your 4-star or 5-star flooring within 30 days of installation, we will replace it for you. If you ever have any installation-related issue in the future, we'll make it right at our expense. 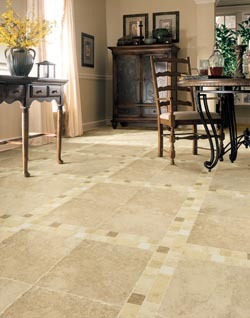 Contact us for assistance in selecting the right ceramic tile floor for your home or business. We serve customers throughout Belleville, Swansea, Fairview Heights, O'Fallon, Shiloh, Scott Air Force Base, Mascoutah, Freeburg, Millstadt, Collinsville, Maryville, Glen Carbon, Smithton, Caseyville, Waterloo, and more of the Metro East surrounding neighborhoods.